I'm so thrilled when I come across a great kitchen in the blogs...they are not so frequent on interior design blogs, so I still say "YES! A kitchen!" and I think interior design bloggers also love kitchens too, I can absolutely feel it. They can't help but put a kitchen in from time to time, one that speaks to them. At least, that's how I see it. I KNOW they love them! The kitchens are often grouped with an entire home's images, so you can see the flow of the home, which is good for context. Here are a few recent ones I've noticed as being special. An Eye For An I:nterior chronicles some very nice kitchens. Take a look through the "pages" of the blog. This rustic kitchen with the (La Cornue?) black range is from the blog. The styles range from rustic to modern, and in between, and the feature with this image is from Sandra Lane, a photographer. Take a look at the Peak of Chic's complete devotion to kitchens! OK, at least on April 24, it was wholly kitchen focused, and I'll take that! I find it very interesting to read how one responds to certain kitchen styles, and this is a peek at some nicely styled kitchens and some insight into what's liked and why. I can easily tell you why I like these kitchens. And, I'm not looking so much at function, I'll save that for another day. But, look at the artwork. The textures. The imperfection as to what's positioned where. OK, maybe the lamp is a bit much right next to the range, but I WOULD have a lamp and just position it to the far right, why not? So, to me, these kitchens are carefully chosen, I'm sure, and they have soul. A special case are the ladies from Desire to Inspire. Jo and Kim sneak in a kitchen image, I think, possibly once or twice a week. 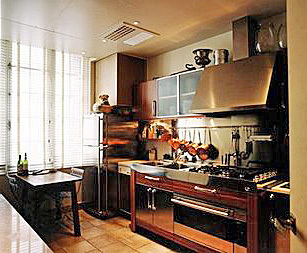 They, too, feature great designers, and whole homes, and include the kitchen, which I always look for first. Just look at this fantastic red and stainless kitchen. Don't you love it? I do. It is part of the work of Tony Ingrao. I DO think, however, that they are admirers of modern kitchens, and/or that soft contemporary look. I'm happy about that, which feeds my natural inclination toward kitchens with clean lines. I am rewarded when I take the time to seek out interior design bloggers' points of view, and it's a bonus to find a kitchen here and there. They are always inspiring. Take a look at these blogs. The images are those which speak to the blogger in a meaningful way. I appreciate their efforts! Do you like these kitchens? What do you like about them?